Dark Hall Mansion, http://www.DarkHallMansion.com, is extremely pleased to welcome back artist, Marq Spusta, in launching DHM’s new ‘Peanuts Moments’ limited edition print series. So wonderful to lead off with Marq’s quiet, lovely, “Woodstock’s Song of Love” limited editions which are available FRI, February 12th! Dark Hall Mansion, under license from Peanuts Worldwide LLC, will release Marq Spusta’s gorgeously detailed editions that find two old friends in a gently reflective moment that at once honors Charles M. Schulz’s timeless legacy while still all Marq Spusta in flavor. 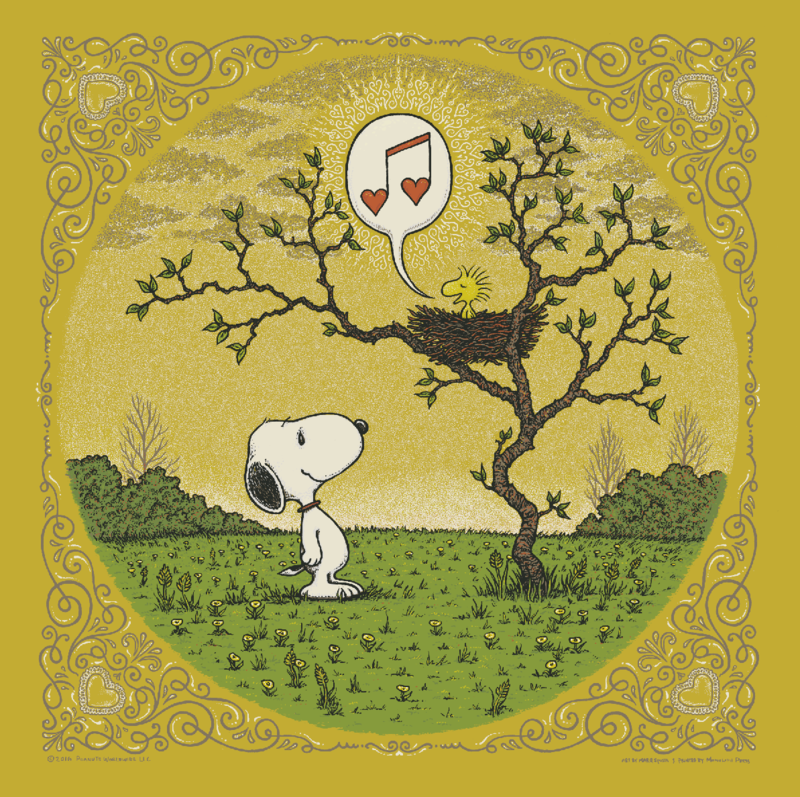 Marq’s piece is at once evocative, harkening to the artist’s personal concerns, while hinting at Woodstock’s origins, particularly since, YES, Charles M. Schulz did indeed name Snoopy’s favorite ‘little birdie’ (nod to Vince Guaraldi) for the epic 1969 music festival-and know Woodstock was voiced by none other than legendary Peanuts director Bill Melendez. By the way, so was Snoopy for those that don’t know! DHM is very excited to introduce our new ‘PEANUTS MOMENTS’ limited edition print series, one that will focus on individual Peanuts characters, and, as the name suggests, truly classic moments from Charles M. Schulz’s Peanuts legacy. Within this series invited artists will take on moments that draw inspiration from Peanuts strips, films, and Schulz artwork that has informed Peanuts and delighted fans across decades, all while allowing each artist to individually reflect and make the characters, series, and moments their own. Be it Charlie Brown and Linus’ incomparable exchanges on a storied wall, Snoopy on his doghouse, or simply Charlie Brown looking pensively skyward atop his pitching mound on a rainy day, expect our ‘PEANUTS MOMENTS’ to be something special…and yes, think you can safely expect Marq Spusta to return with some quite special and personal Peanuts contributions to follow on his first in the series. All editions are strictly limited, measure 12″ x 12,” are screen printed, hand numbered, and are personally signed by artist Marq Spusta, and come along with an extra little Snoopy valentine. PLEASE UNDERSTAND ALL SALES ARE FINAL. Dark Hall Mansion is a labor of love. We are passionate about art, about the work of print and poster artists present and past, here and abroad. We are committed to bringing their skills to the forefront on projects both compelling and exciting, and bridging their studios and creations directly with your walls and personal collections. It’s cool and I tried. More of these will be available from us in the future. As far as I recocgnized the DHM store allowed to buy an unlimited number of prints. No chance to get one. The same with the Pepperland print some time ago. Maybe you can use your influence that they change their drop policy for your prints. Missed it too, that’s why it’s always good to check Marq’s site on off release days as well but I missed this other release from DHM as well as the pepperland prints. Hope that some of you were able to secure one! I hear you Steffen on people purchasing more then one print, I don’t think I am against some wanting to purchase the various variants, along with the original grey clouds one. But when people just purchase more to sell can be annoying, but I believe some purchase more then one at times to make trades for other Spusta prints they might not have or to further fund their collection addictions! While I wish all that truly want these in their collection to secure one, that’s just not reality with how many Spusta collectors and flippers are out there now due to the amount Marq’s prints seem to fetch on the secondary market. It’s sad but just the truth! Truly hope all that desire this print can have further luck on Marq’s release of them!